Relevant and pertinent questions regarding the missed opportunities of our great nation have appeared in the public domain for decades, raised by both local and international economists and other intellectuals alike. Same has also been a popular subject that had been discussed and addressed at many economic forums, public debates, international donor and academic conferences. Whilst pundits have been able to articulate the issue eloquently, its relevant application in public policy is yet to be witnessed to the level to make a meaningful difference to the unfortunate ‘catch 22’ situation we had fallen into with regard to skill development and vocational training of our most important asset – Sri Lankan youth. In this context, the writer attempts to capture the big picture and argue why there should be a swift and concerted drive to mobilise all resources to provide cutting edge training facilities to our youth in the areas such as industrial robotics and artificial intelligence (AI) and automated manufacturing beyond the traditional auto based mechanical training platforms. With still under $ 4,000 GDP per capita, it is becoming a common belief that we had somewhere missed the bus to realise our potential as a country, when compared to both the rapid technological progress achieved by other Asian countries as well as the promise we had shown in the 1950 and 60’s. Whilst is possible to hide behind the separatist war for this phenomenon, we are well aware that the bigger culprit has been the lack of political vision and leadership in the delivering the economic progress we richly deserved. In order to progress beyond the middle income trap many have argued that we need to diversify our export basket, especially by adding higher value finished products. Adding high value technology products would also pave the way to capitalise on opportunities provided by the many FTAs we have already entered into and prop up significantly the export income, thereby allowing the country’s fiscal bodies to manage the growing Balance of Payment deficit efficiently. Part of the funds from the surplus BOP could then be channelled to develop required infrastructure to grow capacity building and advanced skill development, facilitating further FDI inflow and know how transfer to our country. Two countries that have exemplified export oriented industrialisation to become Asian power houses for technology against all odds are Taiwan and South Korea. High value technology does not mean that the products need to be bulky and expensive to make, on the contrary given modern day miniaturisation, electronics, high value parts for space and auto industries, nano technology related products, environment and energy related material are all relatively small but command a higher transfer price and this is exactly what Sri Lanka should try to manufacture as this provides an immediate thrust to leapfrog both in the income we can generate as well as the technology deployed for manufacturing such products within the country. Technologically advanced high value products of such nature are first conceived, researched, prototyped, developed and manufactured in the West due to their innovative culture and business practices. A technology rollout and knowledge transfer then happens when these entities look for profit maximisation by shifting their production bases from West to East. Classic examples include the consumer durables, electronics, telecom related products, computers and auto industries just to name a few. In order to enjoy a piece of this pie, we should have a sweet spot that will seize their attention and what better attraction than an abundance of highly skilled youth in both manufacturing and production technology readily available for deployment. Manufacturing technology is undergoing a massive transition today that some call it the 4th Industrial Revolution. It is common knowledge that given the precision and efficiency with which the industries like to operate, deployment of modern machinery with advanced features need to be commissioned in subject manufacturing plants. This machinery is so advanced that it is a blend of artificial intelligence, industrial robotics and Computer Numerical Control (CNC), seamlessly integrated to provide the backbone infrastructure to achieve what was only a dream a few decades ago. Whilst it is not rocket science for the global players to set up a facility of this nature in any country they so desire, due to improved logistics, what is important is the optimum utilisation of such resources and sustainability of such investments in countries like ours. The 4th Industrial Revolution is characterised by the integration of Advanced Industrial Robotics, Artificial Intelligence (AI), Internet of Things (IOT), Big Data Analytics, 3D printing, Augmented and Virtual Reality (AR & VR) to provide the required backbone infrastructure to change the face and future of production and manufacturing technologies. This is also seen as a move by the developed countries to capture once again a part of the lucrative production and manufacturing opportunities their nations had once lost to cheap labour, back to their turf with the introduction of smarter solutions. The race has already begun and according to published reports, hundreds of billions of dollars have already been invested in the 4th Industrial Revolution. Sri Lanka is blessed with some of the most vital facets that investors yearn for. These include but are not limited to connectivity and reach as a country, convenient inland transport, ports and airports, industrial zones, skilled labour, utilities such as power and water, communication infrastructure etc. Therefore, if promoted well, we should not find it that difficult to attract a few top notch global players who would transform the industrial output of our country. Given the scale and size of our nation, we would require only a few such parties to set up production arms locally as the resulting benefit will be reflected exponentially in our export income given our current product mix. The writer is of the opinion that if the responsible bodies work cohesively and based on a well- structured plan, sans any political impediments, within a period of less than three to five years we could achieve the fruits of our labour. The Board of Investment (BOI), Export Development Board (EDB), Ministry of Higher Education, Ministry of Vocational Training and Skill Development and Ministry of Industries all need to work together to realise this dream. Setting up of facilities for manufacturing and services is closely associated with the availability of skilled labour. Some of the best examples are very close to us if we as a country care not to ignore. The fairy tale story of Indian software industry, Thailand’s success with attracting a large share of global medical tourism and as previously stated how Taiwan has triumphed in the field of electronics and computer hardware manufacturing. In all of the above examples, the respective states have played an active role in facilitating the growth of the industry by investing in the most important asset – capacity building of their youth. Once the government provides and nurtures the area of skill development, the rest will follow almost instantaneously. It will not take long for the multi-national corporations to identify the potential provided in a highly skilled employable youth labour force and they would then follow one after another provided our other macroeconomic conditions are intact in order to attract such high tech industries. It is important that we realise what technology is being used inside these so called high-tech manufacturing facilities and provide required exposure and training to our youth in these specific areas. Use of industrial robots, computer numerical control, computer aided design and manufacturing has been in place for a while now and their direct benefits to such industries have been established globally. Therefore, it is time that we critically evaluate both the curriculae that we follow for our NVQL qualification in Vocational Training sphere and also the technology available for training and to provide hands on exposure to our trainees. When you evaluate the content of the current curriculae and the facilities available especially with relevance to equipment and technologies in place, you do not need a PhD to understand that if we continue with outdated technology platforms and irrelevant course content, attracting high tech industries would forever be an elusive dream. The writer has had the chance to be a part of an international study tour to China, during which the visiting team was exposed to the current best practices in place, in some of the leading technical universities and vocational training centres of excellence in China. 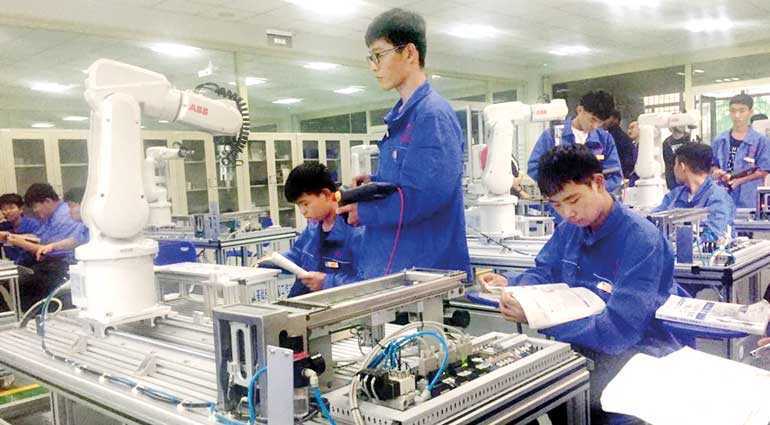 The stark contrast between our two countries approach to skill development and vocational training was identified by the writer and it was evident that the Chinese approach was more proactive and inclusive, with a clear eye on the future. 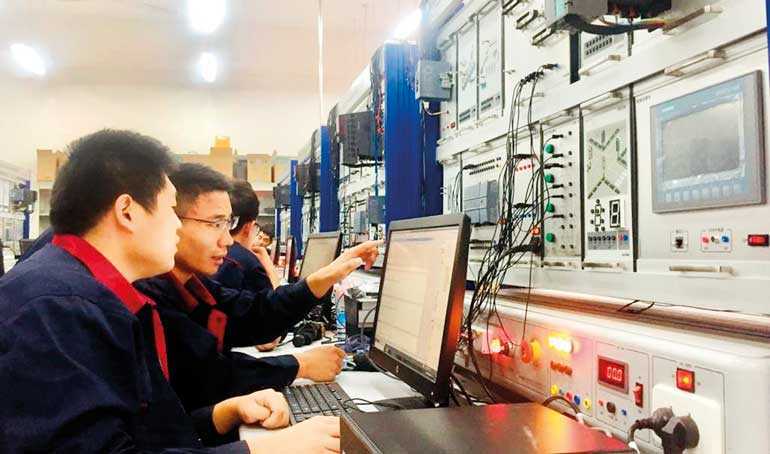 The following salient and noteworthy features of the Chinese approach has been captured by the writer for public discussion in Sri Lanka as deployment of such a framework for the vocational training and skill development of local youth in Sri Lanka seems plausible. 1.Preparing the youth with skills for the future. Given the rapid transformation taking place world over in manufacturing practices, identifying the skills that are required in the future and training our youth with such skills should be the priority motive to ensure that we have highly skilled employable youth either for local or overseas deployment. 2.Complete curriculum modernisation and train the trainer programs with the assistance of well-known overseas polytechnics, vocational training institutes, universities and technical colleges. Since deployment of modern training technology is of little use if we do not have a mechanism in place to secure optimum utilisation of such facilities, we need to ensure that the right skills set is first provided to the trainers and instructors by providing them with the right exposure and expert training opportunities. There are many renowned overseas institutes from China, Malaysia, Singapore, Korea, Japan and Thailand who are willing to volunteer to provide such training opportunities to our teaching staff. 3.Deployment of advanced training technology platforms and setting up of reference centres to provide targeted skill development. Whilst many funding options are available to the government to select from as the area of skill development and vocational training is a pet area for donor assistance from World Bank to many bilateral credit programs, the investment in such technology is relatively expensive. Therefore, rather than proliferating such technologies island wide, the authorities should ensure that we select strategic locations and set up national level reference training centres. This strategy would augment well both for best utilisation and sustainability of such facilities. 4.Setting up of such National level reference training facilities closer to the potential industry hot spots. This would facilitate private public partnership opportunities by allowing the trainees to undergo industrial familiarisation and placement programs from the start, giving them the much needed exposure to acquire and develop both their technical and soft skills. Advanced maritime training facilities at Hambantota/Galle, aeronautical training at Ratmalana/Katunayake, centres for excellence for industrial robotics /AI closer to reputed and up and coming industrial zones are such possibilities that we could achieve by setting up training facilities closer to the potential industry hot spots. Since the state has now facilitated and promoted pharmaceutical manufacturing in the country and many investors have subscribed to the idea by signing joint venture and private public partnership buy back agreements, it will be an obvious advantage to set up such facilities for advanced mechatronics and robotics closer to Koggala (where a number of pharma manufacturing plants are to be located) or designated pharma zones such as in Horana and Kalutara. This approach would then be complementary to the larger policy decisions taken by the government and will only strengthen such timely state intervention. 5.State-sponsored National skill competitions for promotion of advanced technologies amongst youth. Such competitions are an annual event in many developed and developing countries alike. With most of them linked to a direct entry to global or regional international level competition. These would provide the much needed excitement, enthusiasm and exposure to attract our local youth as well as to get them to showcase their hidden talents. Such competitions could be facilitated across boundaries pitting the vocational skill development institutes against Universities and premier Engineering Faculties, etc. in order to give youth who excel in technical education to be recognised nationally and thereby minimising the stigma if any present in our society reference to the standing of the qualification they acquire through such vocational and technical training colleges. To conclude the discussion, the writer wishes to highlight that the current winds of change provides an ideal platform to go deep and narrow in this subject and take the initiatives necessary to transform the most important asset of our country – youth, enabling them to contribute handsomely to national wealth creation in our motherland’s quest to becoming a developed industrialised nation.